Fast Company has placed the Greenway Smart Stove on its list of the Top 14 Design Stories of 2012, prominently featuring the product in the article, declaring it an "example of how a design solution can have profound effects" on the world. 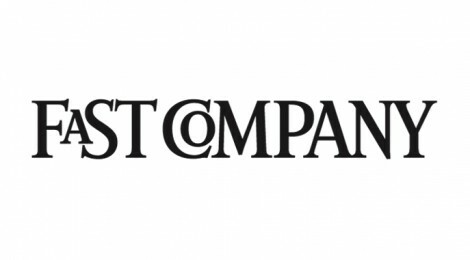 Fast Company had previously covered the Greenway Smart Stove in its Co.Exist section earlier this month. Greenway Grameen Infra and the Greenway Smart Stove were featured in an article in the December 15th edition of Vijay Karnataka, a popular regional newspaper in the southern state. The article, shown at left, features a detailed description of the Greenway Smart Stove and its expanding sales throughout the state. DNA India recently published an article featuring GGI and the Grand Prize win at the Intel Global Challenge at UC Berkeley. 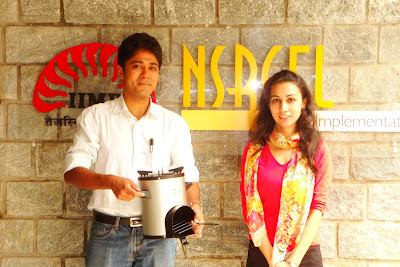 The piece highlights the fact that the company's win at IIM-Bangalore's Next Big Idea competition enabled them to be sent to the Intel Global Challenge. It also notes that this is the "first time in eight years that a team from India has won this award." Click the link to read more. 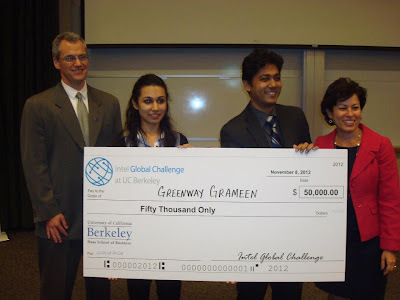 Greenway Grameen Infra was recently featured in India Abroad, a publication from Rediff.com. 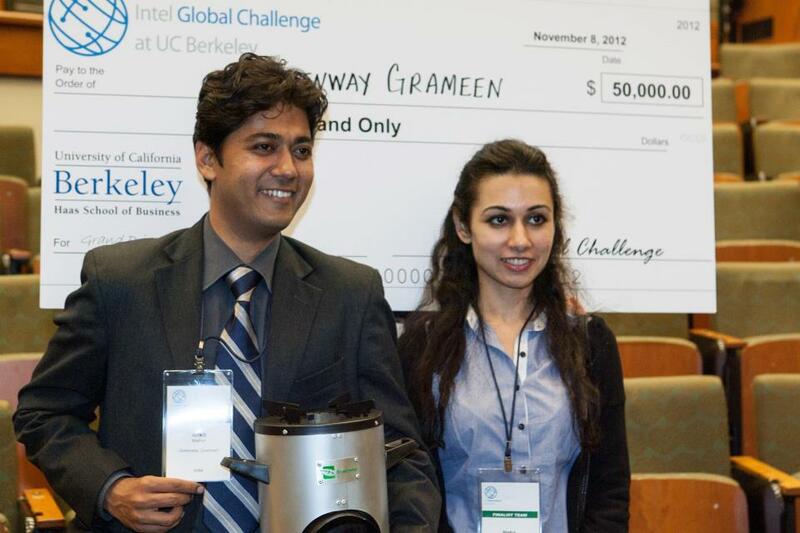 The article highlights the company's recent Grand Prize win at the Intel Global Challenge at UC Berkeley and the benefits that participating in the competition will give the company. It also highlights past successes GGI has seen and the plans the company has for moving forward with its rapidly expanding business. Click the link to read more. Following the Grand Prize win at the Intel Global Challenge, Greenway Grameen Infra was featured in an article on Fast Company's Coexist website. 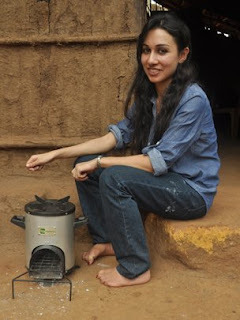 The piece details the company's innovative Greenway Smart Stove and its ability to reduce fuel usage, cut back on smoke emissions and improve the lives of rural people across the world. 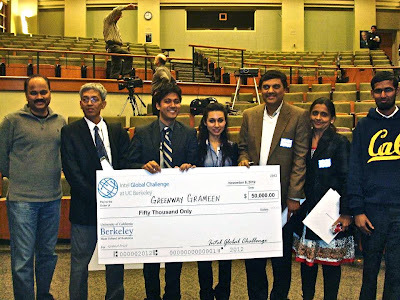 UC Berkeley Press Release: "Greenway Grameen Infra from India Takes Top Prize at Intel Global Challenge"
Hass School of Business Newsroom: "Team from India Wins Intel Award at Haas"
Intel Newsroom: "Student Entrepreneurs from India Win Intel Award for Green Innovation"
Last week, Greenway Grameen Infra was honored with the Women's Impact Award at Sankalp Forum's new Samridhi Social Enterprise Recognition Awards for their work in Lower Income States in India. GGI was recognized for increasing health benefits, time and money savings and quality of life for women in LIS areas such as Jharkhand, Madhya Pradesh, Odisha, Rajasthan and Uttar Pradesh. Check out the news coverage of the event posted here. The Kopernik Technology Marketplace, a third-party NGO, has released the final results of its detailed impact assessment of the Greenway Smart Stove. 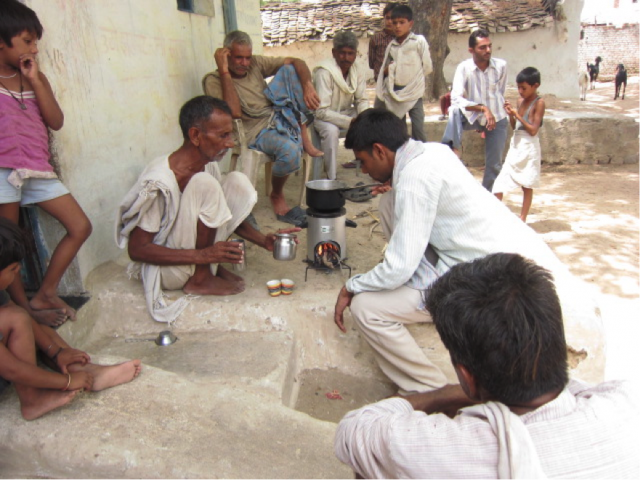 These results indicate that the stoves were successfully integrated into the daily routines of consumers, drastically reducing fuel use and time spent collecting wood and cooking. When using traditional stoves, about 80% of respondents spent an hour or more on wood collection -- with 65% of respondents needing over 2 hours to collect their wood. After the introduction of the Greenway Smart Stoves? The numbers reversed; 65% spent under an hour collecting wood. Consumers also reported decreased time spent cooking the food itself, with the percentage spending an hour or more on cooking decreasing from 43% to 0%. 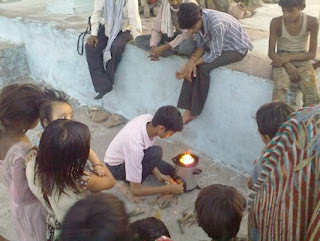 In addition, survey participants used the stove very often, with over 70% reporting that they used it everyday. Overall, consumers were very happy with the product; 74% reported satisfaction in their experience with the Greenway Smart Stove. More about the impact assessment, which was prepared by Kopernik in partnership with local NGOs and conducted in three villages in rural Madhya Pradesh, can be found here. The Greenway Smart Stove is receiving more positive feedback from users in Madhya Pradesh, where partner NGO, Kopernik, has been distributing the cookstove and continually evaluating user experiences with it. Another installment of Kopernik's blog series on their Clean Cooking for Indian Women program was released this week and highlights the stove's excellent reception by users in the village of Chandanpura after using it for several months. 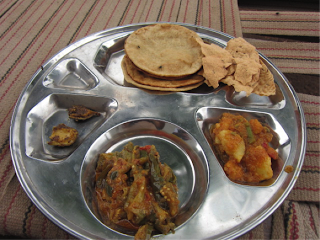 The article includes a picture (at left) of a sample of the delicious meals being cooked on Greenway Smart Stoves in the village! 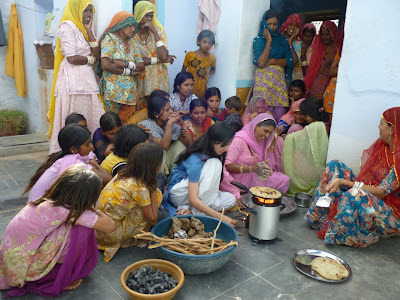 Kopernik just released its follow-up survey with consumers who received the Greenway Smart Stove as part of the organizations' Clean Cooking for Indian Women initiative and the results are extremely positive! The survey reveals consumer satisfaction with the stove is very high, with consumers valuing "the cookstove because it requires less firewood and produces noticeably less smoke." Click the link to read in full! Greenway Grameen Infra is profiled in Outlook Business India's latest issue, in an article highlighting India's brightest young entrepreneurs. The piece (which you must scroll down to see) details GGI's potential for growth and the break-neck pace at which it is developing new products. Today, Kopernik released another update on their Clean Cooking for Indian Women campaign and on users' satisfaction with their Greenway Smart Stoves — the feedback continues to be extremely positive! As we mentioned before, Kopernik's chose Greenway Grameen Infra as its technology partner in its campaign with NGO Haritika. Be sure to click the link to read the Kopernik Fellow's full post on the project's progress. Check out the awesome infographic about Greenway Grameen Infra that was made recently by the team at Sanki.in! The website featured GGI as their "Startup of the Day" and their graphic helps visually demonstrate the story and mission of GGI. Click here to see it in full. Greenway Grameen Infra was covered in today's edition of Dainik Bhaskar, which is, with 1.15 million in circulation, one of the top Hindi newspapers in India and in the world. Times of India has once again featured Greenway Grameen Infra in its pages, this time detailing the company's recent win at IIMB's Next Big Idea Competition. Highlighting the recently published 2011 census, which determined that 70% of Indians use biomass as fuel, the Times article notes the vast potential for growth GGI has and the grounded vision its founders maintain. Greenway Grameen Infra has won the Grand Prize of the Next Big Thing competition, announced IIMB's Nadathur S Raghavan Centre for Entrepreneurial Learning, organizers of the competition. After being selected from thousands of applicants as one of the 30 finalists to compete it IIMB's prestigious Next Big Idea competition, GGI founders Neha Juneja and Ankit Mathur blew judges away with the presentation of their business plan. 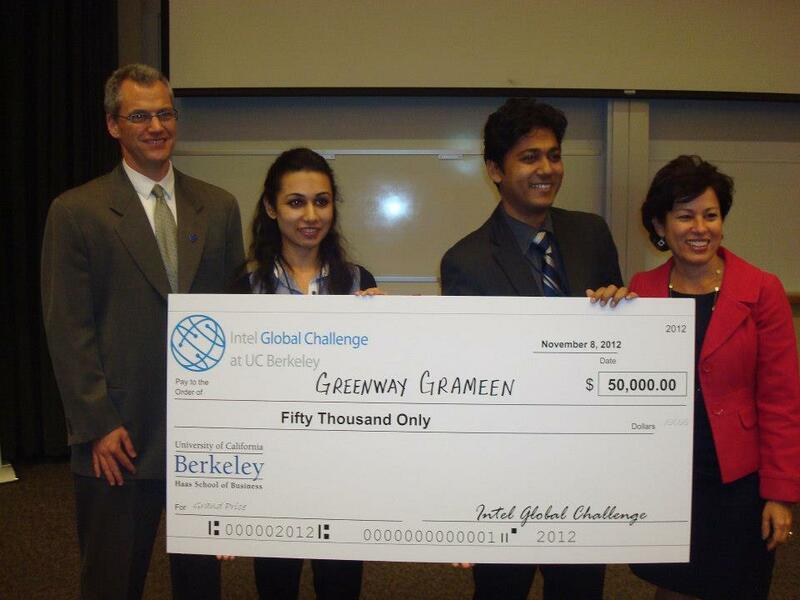 As part of this honor, Neha & Ankit will be sent in November to UC Berkley in San Francisco to compete in Intel's Global Challenge. Greenway Grameen Infra is profiled in another piece for BBC News this week. The article details the company's success in rural India and speculates on the potential for great expansion, noting that business approaches like GGI's that tap into "smaller, more decentralised" markets "can provide excess return." BBC World featured GGI in a new segment about India's booming green tech industry. The segment, which aired this Sunday at 11am, details several innovative business solutions to social and environmental problems throughout India, profiling GGI as a feature success story. 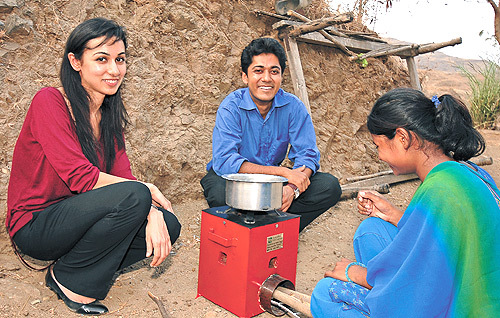 As mentioned previously, the Kopernik Foundation has chosen the Greenway Smart Stove as its partner in its Cleaner Cooking for Indian Women campaign, raising funds to distribute the product at a lowered price to rural consumers most in need. 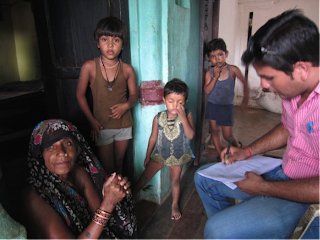 Recently, Kopernik and their NGO partner, Haritika began introducing the award-winning technology to consumers in rural Madhya Pradesh. In a guest post on Kopernik's blog, GGI's VP of Product Development, Shoeb Kazi, details his trip to one of the villages to discuss and demonstrate the stove with consumers. 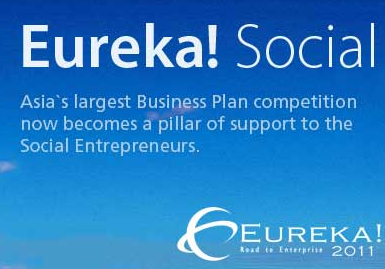 Greenway Grameen Infra has been chosen as one of the 30 teams to compete in the Next Big Idea 2012 competition, IIMB's annual business plan contest! From a "starting pool of over 5000 ideas" IIMB's team narrowed the pool down to around 160 competitors over the past few months and now, after evaluating submitted business plans, has finally picked its 30 teams. The teams will engage in rigorous competition and judging process during the Next Big Idea, held July 3-5th in Bangalore. The top 10 winners will all receive seed funding, potential incubation support and networking resources — and the Grand Prize winners will be sent to San Francisco to compete in Intel's Global Challenge at UC Berkley's Hass School of Business. 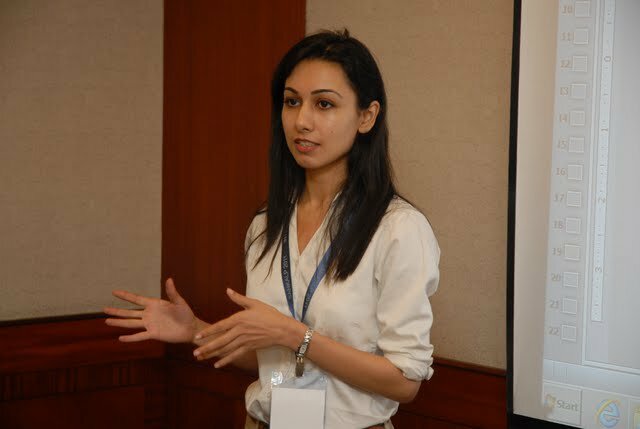 Greenway Grameen Infra founder Neha Juneja is profiled in an article on Nagpur Entrepreneurs, where she discusses the journey of the start-up from idea to execution. Neha sheds light on how GGI was formed and gives tips to aspiring entrepreneurs. Click here to read more. GGI has been featured in India Today's May 7th edition as part of the newspaper's "Ideas Factory." The article highlights the current and potential future success of the company and even hints at what is coming next for GGI. Click here to read more! 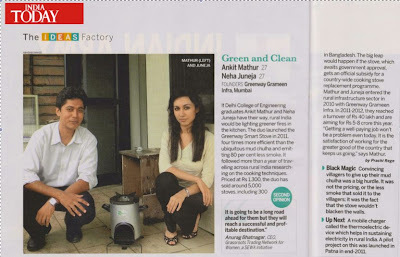 GGI and its founders Neha Juneja and Ankit Mathur are profiled in this month's Smart CEO India Magazine. The piece labels the pair as "grassroots innovators" whose product is able to "deliver both fuel efficiency and health benefits." 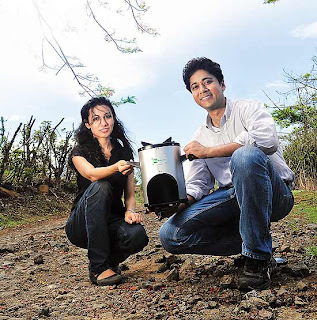 This Monday's Times of India features a story on Greenway Grameen Infra's victory in the 2012 Eureka Awards run by IIT-B. The Times calls GGI, first prize winner Social Business Plan award, a firm that "understand concerns of the rural market and design products to meet their needs." The article goes on to cite Eureka judge Ajay Bhagwat, who highlighted how tough the competition for this award has gotten, saying " the quality of the start-ups has improved. The competitors were more mature and had the potential to sustain — both important for start-ups." Read more about GGI's victory in the Eureka Awards here — and be sure to check out more about the Greenway Smart Stove! 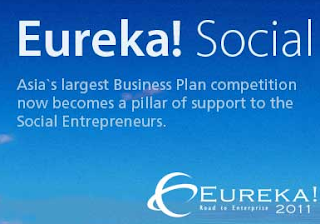 Greenway Grameen Infra Wins Eureka Award's First Place for Social Business Plan! 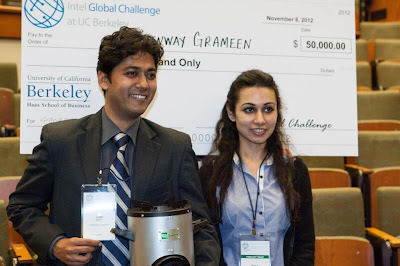 Invent for Humanity has featured Greenway Grameen Infra and its campaign with Kopernik's Smarter Cooking for Indian Women Project on its website. Be sure to donate to Kopernik's project, which seeks to deliver Greenway Smart Stoves to rural consumers at a lowered price. Invent for Humanity's Marketplace is an aggregator of digital campaigns for funding. 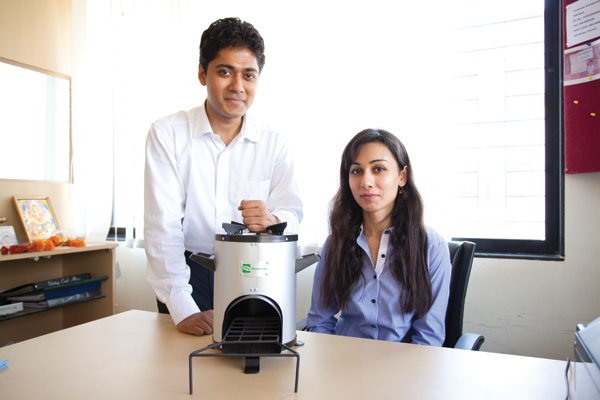 The Greenway Smart Stove was only recently introduced in the states of Maharashtra and Karnataka, but sales are already soaring. 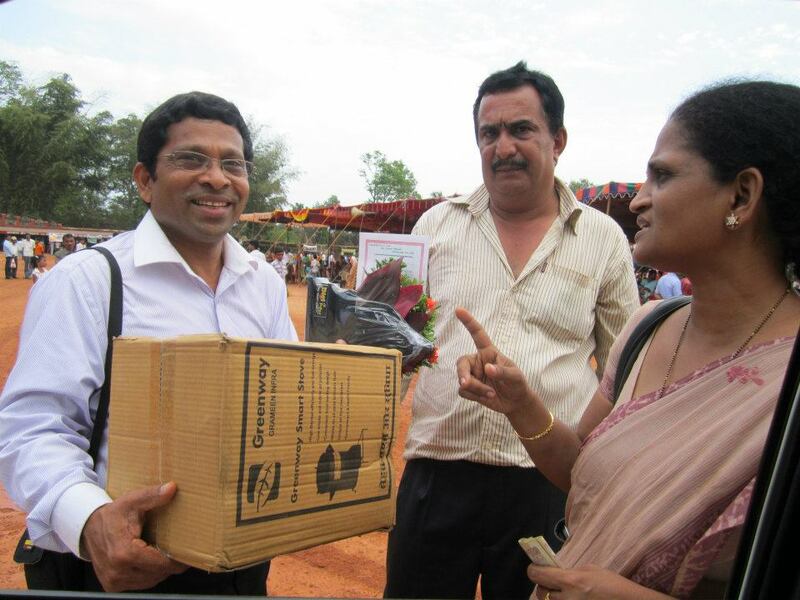 Check out these photos of our sales team on the ground in Karnataka!